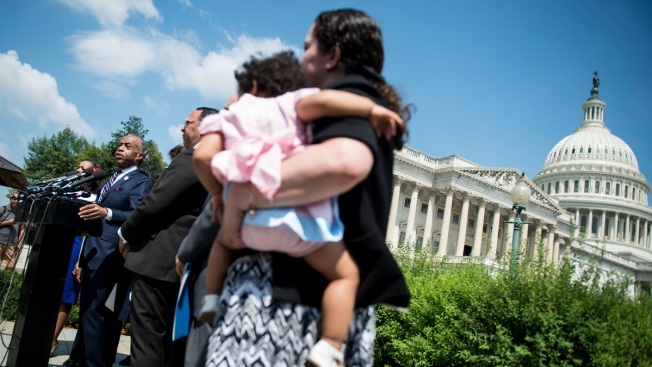 In this June 19, 2018, photo, League of United Latin American Citizens acting CEO Sindy Benavides holds her daughter during a news conference in front of the U.S. Capitol calling on the Trump administration to stop separating children from their families at the U.S. border, in Washington. A mother from Guatemala had her 7-year-old son taken from her after they were detained having illegally crossed the border. She has since been released from custody but immigration officials won't tell her where her son is. Beata Mariana de Jesus Mejia-Mejia filed a lawsuit against the Trump administration Tuesday, asking the judge to order the government to reunite mother and child and other relief related to her case. She did not ask the court to declare the government's current overall practices illegal. Her lawyer, John Shoreman of Washington, D.C., said her case "challenges the United States government's forcible separation of a parent from her young child, notwithstanding the threat of irreparable psychological damage that separation has been universally recognized to cause young children."